Aberthaw Fisher was built in 1966 at the Ailsa Ship Building Company Glasgow and was originally used for transporting heavy loads to the new generation of power stations being built around Britain, hence it's Ro-Ro capability. 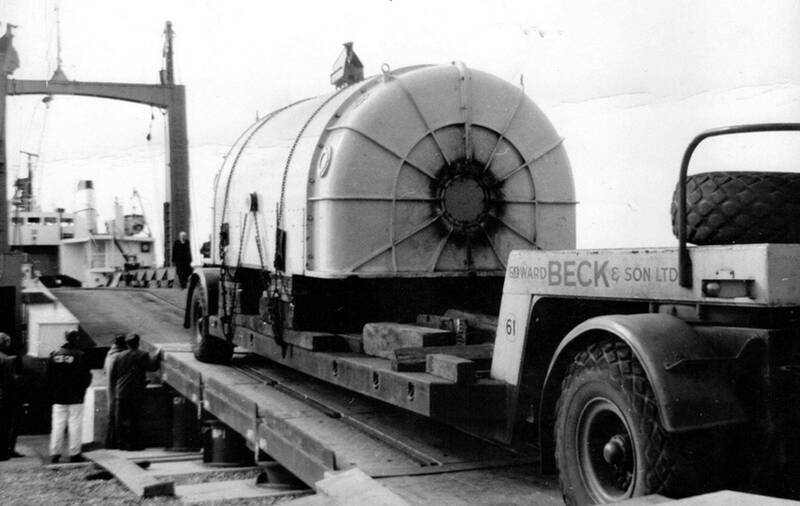 Managed by James Fisher of Barrow many of the heavy haulage companies at that time, including Beck's, found it easier to move large loads from and to the Northwest from the South coast and the North of Scotland by sea. This was a far easier option than use the poor trunk road network that existed during the 1960's which required the negotiating of many town centres, steep hills and narrow roads before the advent of the motorway network as we know it today. 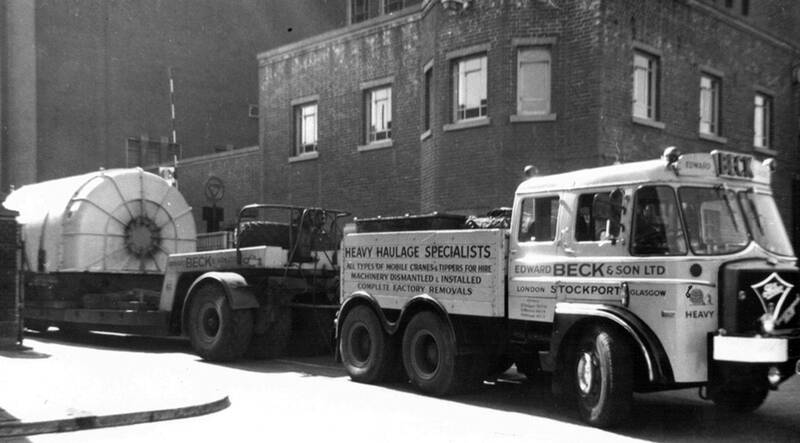 In this series of photographs S20 Foden heavy haulage 6x4 ballast tractor Reg No ODB 793 was driven at the time by Robbie Brownlee with mates Jed Collins and Neil Heginbotham. The load was an 82 ton electric stator being loaded aboard the Aberthaw Fisher at Brighton power station in Spring 1967 and was destined for the English Electric works at Trafford Park Manchester for re-winding. "The move took place on a very damp Saturday morning and the Foden could not maintain traction on the steep steel and timber ramp onto the vessel. 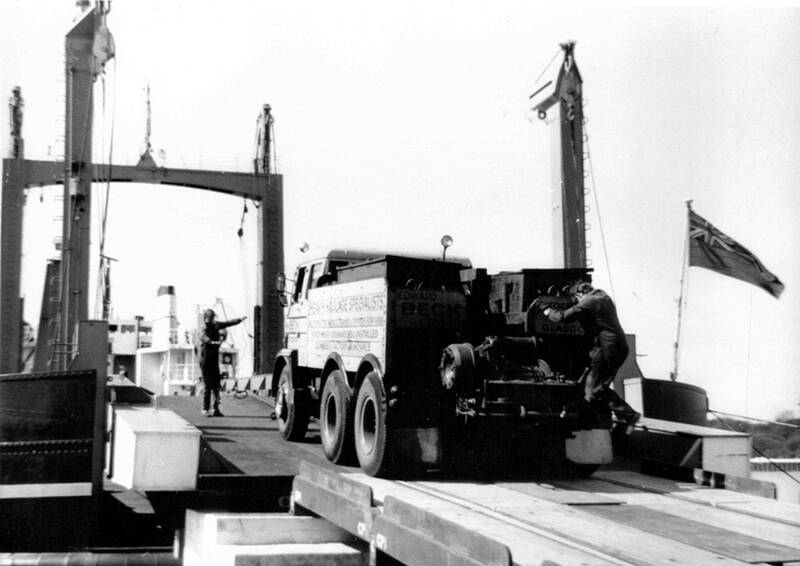 The crew ran out the ships winch and pulled the load aboard whilst Foden ODB 793 steered from the front. Four days later we met the ship at Liverpool and then towed the load to Trafford Park via the A580 East Lancs Road the gross weight for the load was around 120 tons". The Ro-Ro vessel Aberthaw Fisher, built in 1966, was originally used for transporting heavy loads to the new generation of power stations being built around Britain at that time. 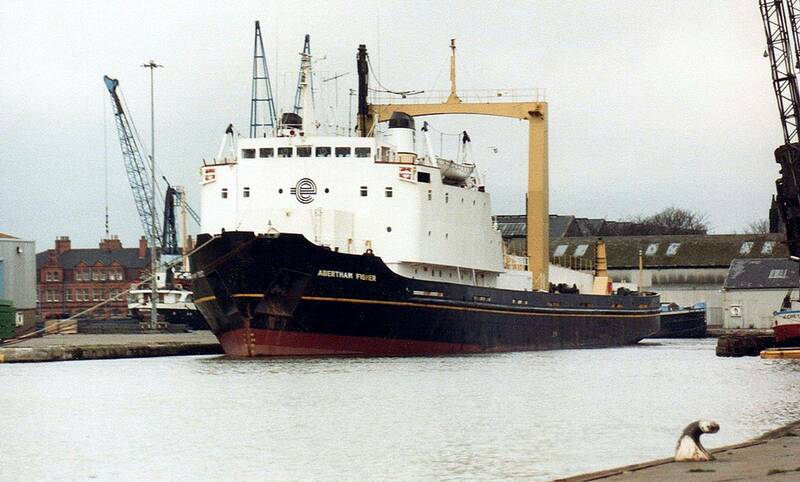 In 1996 the vessel was sold on and converted to a diamond mining ship and renamed Moonstar were it remained in service until October 2000 after which time it was sent to India and broken up for scrap. 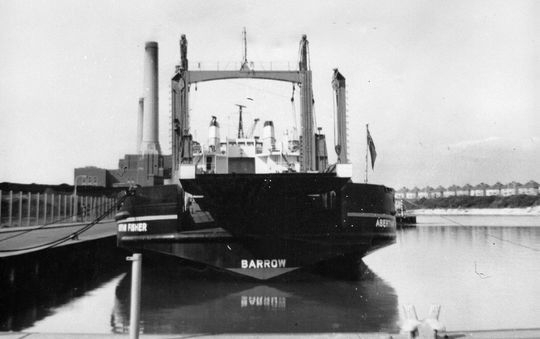 Aberthaw Fisher is seen here in dock at Brighton power station in Spring 1967 awaiting the loading of an 82 ton electric stator destined for English Electric at Trafford Park Manchester for re-winding. S20 Foden heavy haulage 6x4 ballast tractor Reg No ODB 793, driven by Robbie Brownlee, is seen leaving Brighton power station hauling an 82 ton stator. The stator was destined for the English Electric factory at Trafford Park Manchester for re-winding via the Ro-Ro vessel Aberthaw Fisher pictured below. S20 Foden heavy haulage 6x4 ballast tractor Reg No ODB 793, driven by Robbie Brownlee, is seen here steering the front end of the low-loader loaded with an 82 ton stator while being winched aboard the Ro-Ro vessel Aberthaw Fisher. Another shot showing the 82 ton electric stator being winched aboard the Ro-Ro vessel Aberthaw Fisher at Brighton Power station. 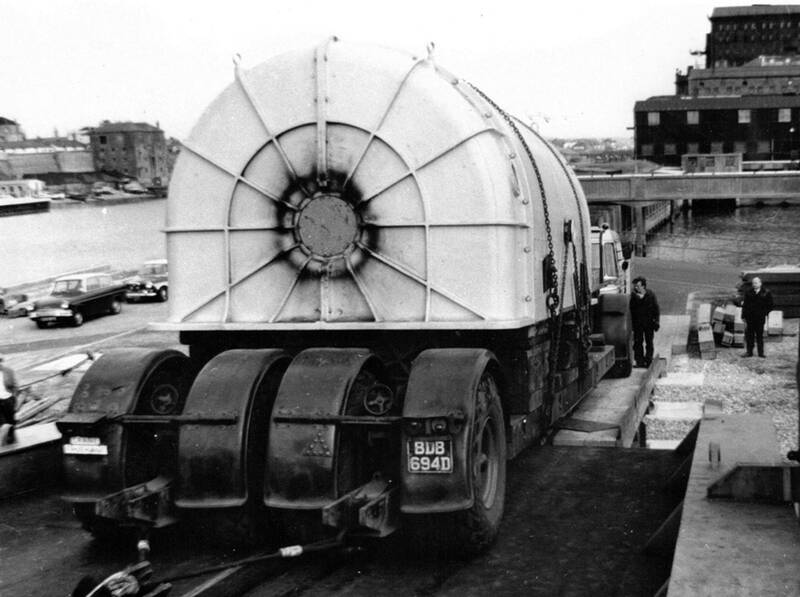 After completing the loading of the low-loader on board ship S20 Foden heavy haulage 6x4 ballast tractor Reg No ODB 793, otherwise known as The Big Bopper, is seen here reversing down the ramp back on to the quayside. On the left is Neil Heginbotham while pictured climbing back onto the rear of the Foden is Jed Collins.